Among the multitude of materials that we make available to the public here at Apologetics Press, we have always sought to provide a single volume that serves as a basic Christian Evidences book. Surveying the Evidence is that book. Serving as somewhat of a textbook, this volume treats the subject in a format that makes it easy to teach a course on Christian Evidences. The book is divided into 13 chapters, making it extremely complementary to a quarterly study course. Each chapter includes questions and “Discussion Areas” to facilitate class discussion and provide students with opportunities to check their comprehension and generate further thought. 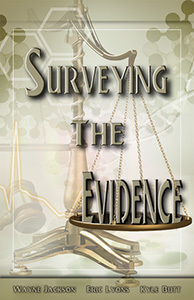 In Surveying the Evidence, all of the basic facts and categories of concern regarding the Christian religion are included: evidence for the existence of God, the inspiration and reliability of the Bible, creation/evolution, dinosaurs, age of the Earth, the historicity, deity, and role of Christ, and even a final lesson on God’s great plan to save man. Whether used by a non-Christian in search of the Truth or a Christian preparing to teach others the facts that set Christianity apart from all other religions, Surveying the Evidence is a valuable and worthwhile study. You might want to consider using this book as a text for a Bible study class for high school, college, or adult ages. All Christians need to know this timeless information.